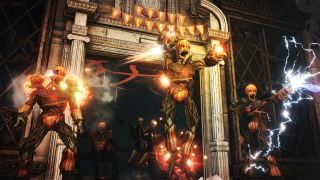 Killing Floor 2 has long been one of our favorite shooters. It regularly shows up in the fabled halls of The PC Gamer Top 100, and we've pointed to it as an example of great grenade design and mesmerizing gun animations. Heck, it's even one of a few games we pointed to last year when we declared a new FPS golden age. OK, so the game is good. Fine. But one of the reasons it stays good and we stay so enamored with it is its near constant stream of big content updates. There's a truly staggering amount of new stuff live now as part of the second annual Halloween update, Halloween Horrors: Monster Masquerade. Let's start with the guns, because developer Tripwire is just so damn good at making cool guns. Commandos can use the MKB42, a brutal early German assault rifle that will be familiar to players of Tripwire's 2011 game, Red Orchestra 2: Heroes of Stalingrad. Graphics and detail have improved a lot since 2011, though, and it's great to see that old warhorse rendered in the intricate details Tripwire is known for. Sharpshooters and Commandos can now equip the FN-FAL, the world-famous NATO battle rifle, and a the HZ Medic Assault Rifle is now ready for Field Medics and, of course, Commandos. All three of the new guns look like they could really chew up a zombie or three. Beyond the guns, a new haunted-house themed map, the Monster's Ball, is a neo-Gothic monstrosity full of spray painted black light graffiti and surprise flamethrowers. Teams with good coordination will be able to open trap doors and and use traps to kill almost as many zombies as they shoot. There's also a suitably spooky new music soundtrack to really put you in that haunted-hayride kind of mood. I'm just hoping it includes Bobby Pickett's "Monster Mash," because that song has always made me want to cut a zombie in half. Finally, if you happen to own the Road Rash revival racing game, Road Redemption, there's a special crossover treat in Killing Floor 2's Halloween update for you. The Road Redeemer, a baseball bat wrapped in steel chains and topped with a ring of spikes, is free for anyone who owns both games. I've seen what this thing does to a zombie, and I'm still trying to wash the brains out of my hair. And to complete the crossover, Killing Floor 2's Hans Volter and DJ Skully characters are available as riders in Road Redemption.